Award-winning vocal/percussion group Coco's Lunch are dedicated to composing and performing scintillating songs for young people that are clever, catchy and full of zest! This album was nominated for Best Children's Album at the 2007 ARIAs. Coco's Lunch are 'Melbourne's magical purveyors of the a cappella art' and Australia's most important exponents of contemporary Australian vocal music and quality music for young audiences. Renowned for their extraordinary song writing, disarming originality and stunning live performances for both adults and children, these singers have been nominated for a host of Australian and American music awards. They have received standing ovations for their concerts throughout Australia, Asia, Canada and Europe, and in 2003 scored at the USA Contemporary A Cappella Recording Awards for their album A Whole New Way of Getting Dressed - BEST FOLK/WORLD SONG (Thulele Mama Ya by Lisa Young) and RUNNER-UP BEST FOLK/WORLD ALBUM. Coco's Lunch have recorded numerous independent albums of original songs for both adults and children, and their award-winning work has been featured on countless compilation albums, anthologies, documentaries and films. These five singer/composers have performed magical seasons for children across Australia in venues such as the Sydney Opera House, the Famous Spiegeltent and the Victorian Arts Centre, and toured with the Musica Viva In Schools program throughout Australia and Asia. 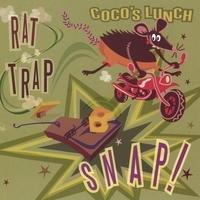 RAT TRAP SNAP!, the latest children's release by Coco's Lunch, will have children enchanted and adults in stitches! From aliens arriving for lunch, to Miss Muffet wanting to be a jazz singer, this album will have children snapping their rat traps, clapping, mamboing and using their voices in all kinds of quirky, creative ways. Rat Trap Snaps, Crackles and Pops..Yeah! Great kids' CD that parents will enjoy too! After only a week of listening to the CD, "Alien at my table" is our family's most favority song ever and phrases out of it (upsa upsa daisy, this lunch is getting crazy!) have easily been adopted into our vernacular. Some of the songs are truly brilliant, even if the a-capella voices may not be everone's cup of tea. We like it though!